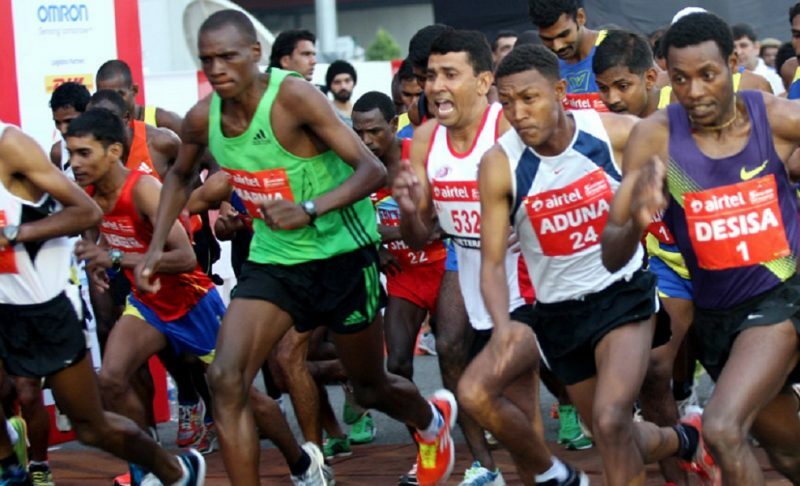 Kenya's Geoffrey Kipsang and compatriot Lucy Kabuu will storm the 2013 Airtel Delhi Half Marathon on December 15 looking for a fast race. The Kenyan pair won the men's and women's races at the Ras Al Khaimah Half Marathon in February, with world leading and personal best times of 58:54 and 66:09 respectively. The half marathon next weekend will have one of the best fields ever assembled for a Half-marathon race: the world-leading men and women from 2013 and 2012, three of the four most recent World Half-marathon champions, the defending champions from last year’s Delhi Half Marathon, and two talented distance runners who will be making their half-marathon debut. "This elite field includes 11 men who have run under 60 minutes, of which four have run even below 59,” said elite athlete coordinator Jos Hermens. “Also present will be the world’s fastest man and woman of 2013 over the half marathon distance, and 12 athletes who have won medals at various World Championships and one World record-holder." Other athletes to watch include defending champion Edwin Kipyego, Chicago Marathon champion Dennis Kimetto, 2010 World Half Marathon champion Wilson Kiprop, 2010 World Half bronze medallist Sammy Kitwara and 2012 world leader Atsedu Tsegay. Kenya’s Vincent Chepkok, the 2011 World cross-country bronze medallist with PBs of 12:51.45 and 26:51.68 for 5000m and 10,000m, will be making his debut over the distance. In the women’s race, Kabuu will face stiff competition from defending champion Wude Ayalew, World 10,000m silver medallist Gladys Cherono, 2010 World Half Marathon champion and 2009 World cross-country champion Florence Kiplagat, two-time World cross-country champion Emily Chebet and 2012 World Half Marathon champion Meseret Hailu. Ethiopia’s Sentayehu Ejigu, the 2010 World indoor 3000m bronze medallist and one of the fastest women of all time over 5000m, will be contesting her first ever Half-marathon race following a promising 31:33 clocking in Boston in October.